Foodmantra: Today I climbed my Everest.. The Rajasthani Thali. Today I climbed my Everest.. 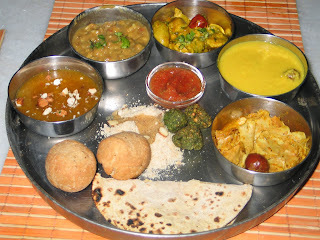 The Rajasthani Thali. All day, I worked on Rajasthani recipes, experimenting, enhancing and improving the flavours. Which flavours are more pronounced? Which ones are missing and which ones need to get stronger? Finally, I have succeeded in putting together good recipes together, which have compatible flavours, well pronounced and married in the correct proportions. I would love to tell you those recipes, but tonight I am out of energy, so here is a little preview of the recipes that I will let you know in a day or two.